Painting the exterior walls of your property will not only enhance its appearance but protect it from moisture, mould, corrosion and other issues caused by the severe weather conditions. Real Painters in Woodford offer effective and reliable solutions for your exterior painting needs tailored to your personal taste and preferences. No matter whether you need to paint the exterior walls of your house, garden furniture, deck, drainpipes or any other area, Real Painters in Woodford will be happy to do it for you with utmost care and meticulous attention to detail. Our professional painters will give your exterior surfaces a completely new look and add value to your property. 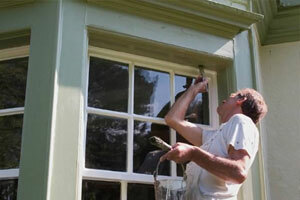 This service includes preparation work and decoration work. First, we will remove the dust and debris from the exterior surfaces, repair and repoint masonry, eliminate rust, fill all cracks and holes or complete other jobs to prepare the areas for smooth painting. After this is done, we will paint the walls and other places you have pointed, such as sills, windows, doors, frames, columns and other decorative elements. According to your property type and its exterior surface material, we will choose the paint that best suits its needs – for wood, masonry or metal. Before starting any painting job, we will prepare the surface by cleaning up all dust and dirt, repairing masonry, handling rust, applying a primer or doing other preparation work that is required for a smooth painting performance. So you need to have your façade painted by real professionals in Woodford, simply reach Real Painters on 020 3026 9530 and arrange a visit from us. Our skillful specialists are available from Monday to Friday (from 8 am to 7 pm) to come and discuss your exterior painting needs, and offer the most suitable solution for you.